J Cancer Metastasis Treat 2019;5:29.10.20517/2394-4722.2018.88© The Author(s) 2019. 1Department of Experimental Medicine, University of Rome “Tor Vergata”, Via Montpellier 1, Rome 00133, Italy. 2Department of Biomedicine and Prevention, University of Rome “Tor Vergata”, Via Montpellier 1, Rome 00133, Italy. 3San Raffaele University, Via di Val Cannuta 247, Rome 00166, Italy. 4Assing S.p.a, Via Edoardo Amaldi 14, Monterotondo 00015, Italy. 5Diagnostica Medica’ & “Villa dei Platani”, Neuromed Group, Avellino 83100, Italy. Aim: To correlate the microcalcifications’ characteristics, such as morphology and elemental compositions, with the occurrence of bone metastatic lesions at 5 years from diagnosis. Methods: In this retrospective study, we enrolled 70 patients from which we collected one breast biopsy each. From each biopsy, paraffin serial sections were obtained to perform histological classifications, immunohistochemical analyses and Energy Dispersive X-ray evaluation. Results: Microcalcifications analysis showed a significant association between the presence of calcium crystals made of magnesium substituted hydroxyapatite and the development of bone metastasis from 5 years from diagnosis. No significant association was observed by evaluation the morphological appearance of microcalcifications. Immunohistochemical analysis displayed a significant association between the expression of bone morphogenetic proteins 2 and pentraxin-3, two osteoblast induction factors, and the formation of bone metastatic lesions. Conclusion: Results here reported highlighted the possible use of breast microcalcifications as a negative prognostic marker of bone metastatic diseases. 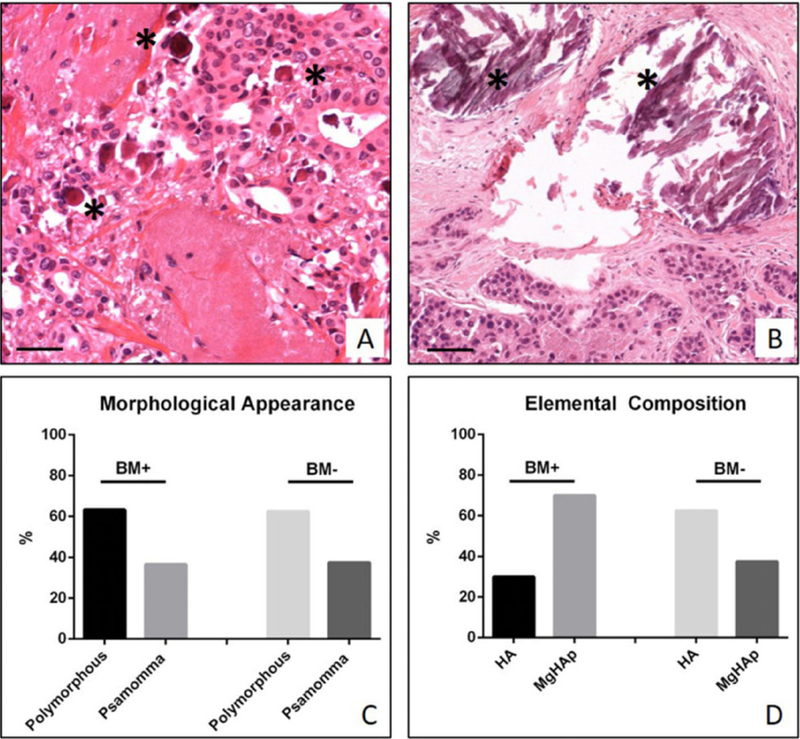 In particular, the association between elemental composition of breast microcalcifications and the formation of bone lesions can lay the foundation for the development of new in vivo diagnostic tools based on the analysis of microcalcifications and capable to predict the formation of bone metastasis. Bone metastasis from breast cancer represent the main disability associated to breast cancer[1,2]. Indeed, the occurrence of bone metastatic lesions affected the patients’ quality of life by inducing pain, hypercalcemia, bone fracture and spinal compression. Also, the progression of metastatic lesions is often the cause of the patient’s death. In this context, the early identification of breast cancer lesions with high propensity to form bone metastasis could improve the patient’s survival allowing to clinicians to choose the more appropriate therapeutical protocol. In the last years, several studies investigated the cellular and molecular mechanisms involved in the breast cancer osteotropism[3-6]. In particular, our group described, for the first time, a new breast cancer cell type showing an osteoblast-like phenotype, the breast osteoblast-like cells (BOLCs). As the real osteoblasts, it is demonstrated that these cells are capable to product calcium crystals made of hydroxyapatite (HA) of magnesium substituted hydroxyapatite (MgHAp) in a process similar to the physiological mineralization. Several molecules have been associated to the process of the formation of microcalcifications in breast cancer. Among them, deserve particular mention the bone morphogenetic proteins 2 (BMP-2) and pentraxin-3 (PTX3). BMP-2 is currently considered the most powerful osteoblast induction factor, whereas it is recently demonstrated the ability of PTX3 to induce both osteoblast proliferation and activity[9,10]. In particular, studies of Scimeca et al. highlighted the essential role of PTX3 in bone metabolisms founding a correlation between the impairment of PTX3 expression and the inhibition of osteoblast activity. In these reports authors suggested a direct role of PTX3 in the assembly of HA crystals. Surprisingly, the presence of BOLCs into breast cancer lesions is also associated to the development of bone metastatic lesions at five years from diagnosis. Therefore, the presence of microcalcifications made of HA or MgHAp in breast lesions could be considered as a negative prognostic factor for bone metastatic diseases as well as the BOLCs. Starting from these considerations, the aim of this study was to correlate the microcalcifications’ characteristics, such as morphology and elemental compositions, with the occurrence of bone metastatic lesions at 5 years from diagnosis. In this retrospective study, we enrolled 70 patients from which we collected one breast biopsy each. Our study protocol was approved by independent ethical committee. From each biopsy, paraffin serial sections were obtained to perform histological classifications, immunohistochemical analyses and energy dispersive X-ray (EDX) evaluation. Exclusion criteria were history of previously or concomitant other neoplastic diseases, autoimmune diseases, viral chronic infections (HBV, HCV, and HIV), and any antitumoral treatment received before biopsy. After fixation in 10% buffered formalin for 24 h, breast tissues were paraffin embedded. Four μm thick sections were stained with haematoxylin-eosin (H&E). The EDX microanalysis is a technology that performs the elemental and chemical analysis of a sample in a transmission electron microscope. When the electron beam in an electron microscope hits a thin sample, some atoms of the sample will be excited or ionized. When they return into their ground state, they will emit characteristic X-rays. The X-ray emission at different wavelengths may then be measured by a photon-energy-sensitive detector[12,13]. The EDX detector system performs a simultaneous display of all mid-energy (1-20 keV) X-rays collected during any individual analysis period. Therefore, it is possible to detect those elements with N.A. > 10. The minimal detectable elemental concentration, which requires some signal averaging, is approximately 0.1 mmol/kg of dry specimen (i.e., 10 ppm), whereas spatial resolution ranges from about 10 nm to a few micrometers[12,13]. All breast samples underwent ultrastructural microanalysis. Following to the identification of microcalcifications, six-micrometer-thick paraffin sections were embedded in Epon resin as previously described. Briefly, sections were de-paraffinized, hydrated, osmium tetroxide-fixed, dehydrated in ethanol and propylene oxide and infiltrated in Epon. The embedding capsules were positioned over areas containing microcalcifications identified by Toluidine Blue staining previously. Unstained ultra-thin sections of approximately 100-nm-thick were mounted on copper grids for microanalysis. EDX spectra of microcalcifications were acquired with a Hitachi 7100FA transmission electron microscope (Hitachi, Schaumburg, IL, USA) and an EDX detector (Thermo Scientific, Waltham, MA, USA) at an acceleration voltage of 75 KeV and magnification of 12,000. Spectra were semi-quantitatively analyzed by the Noram System Six software (Thermo Scientific, Waltham, MA, USA) using the standardless Cliff-Lorimer k-factor method[12,13]. The EDX microanalysis apparatus was calibrated using an X-ray microanalysis standard (Micro-Analysis Consultants Ltd., Cambridgeshire, UK). We employed immunohistochemical techniques to study the expression of molecules associated to microcalcifications production, PTX3 and BMP-2. Briefly, antigen retrieval was performed on 3-μm-thick paraffin sections using EDTA citrate pH 7.8 buffers for 30 min at 95 °C. Sections were then incubated for 1 h at room temperature with the following primary antibodies diluted 1:100: BMP-2 (clone N/A; Novus Biologicals, USA) and PTX3 (clone MNB1; Abcam, UK). Reactions were revealed by HRP-DAB Detection Kit (UCS Diagnostic, Italy). To assess the background of immuno-staining we included a negative control for each reaction by incubating the sections with secondary antibodies (HRP) and detection system (DAB). Reactions have been set-up by using specific control tissues as indicated in the data sheets. Separate χ2 tests were used to assess the associations between morphological appearance and experimental groups and between elemental composition and experimental groups. Difference between the expression of biomarkers evaluated by immunohistochemistry were evaluated by Mann Whitney test. Immunohistochemical values were reported as mean value ± standard error. The study of H&E sections allowed us to classify breast biopsies in ductal infiltrating carcinomas according to Nottingham Histological system. Specifically, we observed 15/70 G1 infiltrating carcinomas, 38/70 G2 infiltrating carcinomas and 17/70 G3 infiltrating carcinomas. Also, based on the presence of metastatic lesions at 5 years from diagnosis, biopsies collected in the study were classified as follow: 30 infiltrating carcinomas of patients with clinical evidence of bone metastasis (BM+) (59.65 ± 1.23 years) and 40 infiltrating carcinomas of patients without clinical evidence of bone metastasis (BM-) (57.91 ± 0.96 years). Microcalcifications were detectable in 63.3% of BM+ and in 62.5% of BM-. From morphological point of view, we observed 63.3% of psammomabodies and 36.7% of polymorphous calcifications in BM+ and 62.5% of psammomabodies and 37.5% of polymorphous calcifications in BM- [Figure 1A-C]. Analysis of the elemental composition of microcalcifications revealed the presence of two form of calcium crystals in our samples: HA, and MgHAp [Figure 1D]. Statistical analysis shows a significant distribution of these types of calcifications in BM+ and BM- [Figure 1D]. In particular, calcifications of BM+ group were 70% MgHAp and 30% HA, whereas in BM- group we noted 37.5% of MgHAp and 62.5% of HA [Figure 1D]. We employed immunohistochemical techniques to study the expression of two osteoblast induction factors, BMP-2 and PTX3. Immunohistochemical positivity was evaluated on digital images (Iscan Coreo, Ventana, Tucson, AZ, USA) by a semi-quantitative approach. Specifically, immunoreactions for BMP-2 and PTX3 were evaluated by counting the number of positive breast infiltrating cells (out of a total of 500 in randomly selected regions). 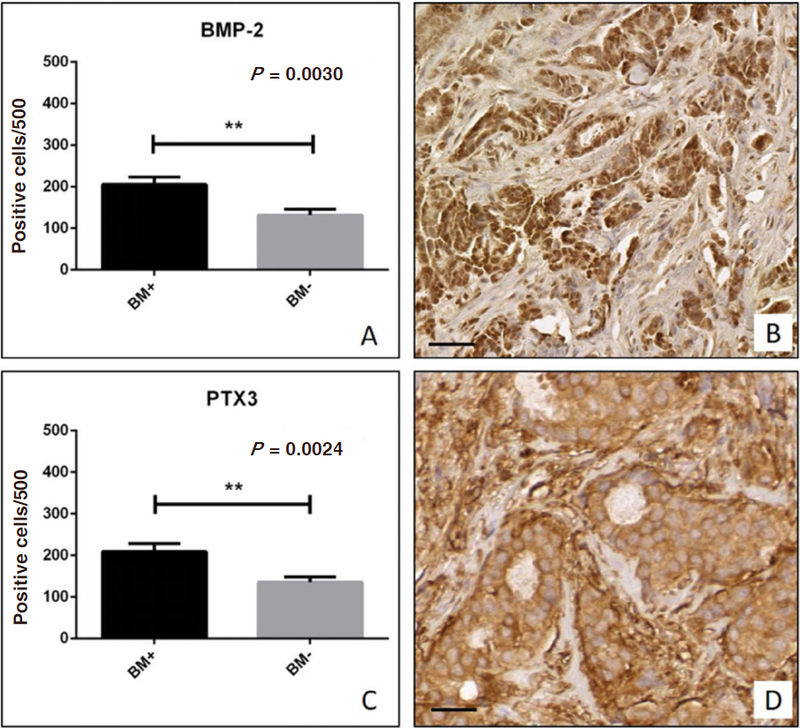 Our results showed a significant increase of BMP-2 expression in BM+ breast lesions as compared to BM- group (BM+ 205.6 ± 17.57; BM- 131.8 ± 14.17; P = 0.030) [Figure 2A and B]. In agreement with this, we also observed a significant increase of PTX3 expression in patients of BM+ group as compared to those of BM- (BM+ 209.0 ± 19.32; BM- 135.6 ± 13.10; P = 0.0024) [Figure 2C and D]. In the last years, numerous studies highlighted the role of breast microcalcifications in the patho-physiogenesis of both breast cancer occurrence and progression[3-6,15,16]. In particular, we recently demonstrated the presence of breast cancer cells with an osteoblast phenotype (breast osteoblast-like cells-BOLCs) able to product microcalcifications made of HA or MgHAp. Noteworthy, the breast cancer lesions characterized by the presence of BOLCs showed high propensity to form bone metastasis. Thus, the presence of microcalcifications in breast lesions could represent a negative prognostic marker for metastatic diseases. Starting from these considerations, the aim of this study was to correlate the microcalcifications’ characteristics, such as morphology and elemental compositions, with the occurrence of bone metastatic lesions at 5 years from diagnosis. To this end, we retrospectively collected breast cancer lesions of patients with (BM+) or without (BM-) clinical evidence of bone metastatic lesions. Our results clearly indicate that elemental composition, but not morphological appearance, of breast microcalcifications can predict the presence or development of bone metastatic lesions. In particular, according with the data reported by Bonfiglio et al., in this study the breast cancer lesions of BM+ patients were frequently characterized by the presence calcifications made of MgHAp. Thus, the presence of MgHAp could play an active role in breast cancer progression. Indeed, as hypothesized in our previously study, the ability of HA to bind Mg can support the neoplastic progression by inhibiting the activity of DNA repair enzymes that require Mg as co-factor. These data further support the hypothesis that the bone metastatic process of breast cancer can be driven by BOLCs. Indeed, we also noted that breast cancer cells of BM+ patients acquired the capability to express two of the most important osteoblast induction factors such as BMP-2 and PTX3. BMP-2 is a member of TGF-β superfamily that which regulate numerous process in bone metabolisms. Specifically, BMP-2 is involved in both mesenchymal stem cells recruitment and differentiation into mature osteoblasts. In a recent paper, Scimeca et al. demonstrated the expression of BMP-2 by BOLCs. PTX3, also known as TNF-inducible gene 14 protein, is a molecule involved in several process of innate immunity[17,18]. It is also demonstrated that PTX3 have a role in the extracellular matrix formation as well as bone formation. In this context, the expression of BMP-2 and PTX3 in BM+ lesions can provide a scientific rationale for BOLCs development and microcalcifications formation. Also, it is known that both BMP-2 and PTX3 are involved in the EMT phenomenon. Thus, it is possible to speculate that these molecules have role both in BOLCs generation that in the production of HA or MgHAp crystals by the BOLCs themselves. In conclusion, results here reported highlighted the possible use of breast microcalcifications as a negative prognostic marker of bone metastatic diseases. In particular, the association between elemental composition of breast microcalcifications and the formation of bone lesions can lay the foundation for the development of new in vivo diagnostic tools based on the analysis of microcalcifications and capable to predict the formation of bone metastasis. In this scenario, the in vivo analysis of elemental composition of microcalcifications by RAMAN spectroscopy could improve the clinical armamentarium available for the diagnosis and stadiation of breast cancer. The data used to support the findings of this study are included within the article. Further details can be made available upon request. Our study protocol was approved by independent ethical committee. Experimental procedures were carried out according to The Code of Ethics of the World Medical Association (Declaration of Helsinki). Specimens were handled and carried out in accordance with the approved guidelines. 1. Riihimäki M, Thomsen H, Sundquist K, Sundquist J, Hemminki K. Clinical landscape of cancer metastases. Cancer Med 2018;7:5534-42. 2. Schneider G, Voltz R, Gaertner J. Cancer pain management and bone metastases: an update for the clinician. Breast Care (Basel) 2012;7:113-20. 3. Scimeca M, Urbano N, Bonfiglio R, Schillaci O, Bonanno E. Breast osteoblast-like cells: a new biomarker for the management of breast cancer. Br J Cancer 2018;119:1129-32. 4. Scimeca M, Bonfiglio R, Montanaro M, Bonanno E. Osteoblast-like cells in human cancers: new cell type and reliable markers for bone metastasis. Future Oncol 2018;14:9-11. 5. Scimeca M, Giannini E, Antonacci C, Pistolese CA, Spagnoli LG, et al. Microcalcifications in breast cancer: an active phenomenon mediated by epithelial cells with mesenchymal characteristics. BMC Cancer 2014;14:286. 6. Cox RF, Morgan MP. Microcalcifications in breast cancer: lessons from physiological mineralization. Bone 2013;53:437-50. 7. Scimeca M, Antonacci C, Toschi N, Giannini E, Bonfiglio R, et al. Breast osteoblast-like cells: a reliable early marker for bone metastases from breast cancer. Clin Breast Cancer 2018;18:e659-69. 8. Liu T, Gao Y, Sakamoto K, Minamizato T, Furukawa K, et al. BMP-2 promotes differentiation of osteoblasts and chondroblasts in Runx2-deficient cell lines. J Cell Physiol 2007;211:728-35. 9. Scimeca M, Salustri A, Bonanno E, Nardozi D, Rao C, et al. Impairment of PTX3 expression in osteoblasts: a key element for osteoporosis. Cell Death Dis 2017;8:e3125. 10. Tarantino U, Feola M, Celi M, Scimeca M. PTX3: a new mediator of bone metabolism and osteoporosis. Muscles Ligaments Tendons J 2017;7:200-1. 11. Bischetti S, Scimeca M, Bonanno E, Federici M, Anemona L, et al. Carotid plaque instability is not related to quantity but to elemental composition of calcification. Nutr Metab Cardiovasc Dis 2017;27:768-74. 12. Scimeca M, Pietroiusti A, Milano F, Anemona L, Orlandi A, et al. Elemental analysis of histological specimens: a method to unmask nano asbestos fibers. Eur J Histochem 2016;60:2573. 13. Scimeca M, Bischetti S, Lamsira HK, Bonfiglio R, Bonanno E. Energy dispersive X-ray (EDX) microanalysis: a powerful tool in biomedical research and diagnosis. Eur J Histochem 2018;62:2841. 14. Elston CW, Ellis IO. Pathological prognostic factors in breast cancer I. The value of histological grade in breast cancer: experience from a large study with long-term follow-up. Histopathology 1991;19:403-10. 15. Bonfiglio R, Scimeca M, Toschi N, Pistolese CA, Giannini E, et al. Radiological, histological and chemical analysis of breast microcalcifications: diagnostic value and biological significance. J Mammary Gland Biol Neoplasia 2018;23:89-99. 16. Bonfiglio R, Scimeca M, Urbano N, Bonanno E, Schillaci O. Breast microcalcifications: biological and diagnostic perspectives. Future Oncol 2018;14:3097-99. 17. Garlanda C, Bottazzi B, Magrini E, Inforzato A, Mantovani A. PTX3, a humoral pattern recognition molecule, in innate immunity, tissue repair, and cancer. Physiol Rev 2018;98:623-39. 18. Mantovani A. Redundancy and robustness versus division of labour and specialization in innate immunity. Semin Immunol 2018;36:28-30.